As if high school wasn't difficult enough, Amy has cerebral palsy and needs help getting between classes so she always has an aide with her. For senior year, she decides to hire other students as aides rather than adults in an attempt to possibly, finally, make some friends. One of her aides is Matthew, whose constant counting and hand-washing have made socializing a bit challenging for him as well. Amy and Matthew understand each other and become friends right away, though slowly they both realize that their feelings are something more. What I love the most about this story is the message about how many kinds of disabilities there are - and how many of us don't fit into the mold one way or another - but how it's just more visible with some people than others. Amy couldn't get around very well, or talk without using a device, but she was super smart and determined and fearless. Matthew was outwardly perfectly fine, but paralyzed by obsessive-compulsive disorder. They were both misunderstood by others but totally got each other in a fundamental way. Best of all, they both challenged and helped each other in the most important parts of their lives. Being described as The Fault in Our Stars meets Eleanor & Park is a pretty tall expectation to live up to, but the comparison makes a lot of sense and I think fans of those other books will love this one too. Personally, I didn't love it quite as much, but it was still one of the best teen novels I've read in a while. As with those two other books, the strength is in the characters, self-aware but still flawed, and the way their relationship builds throughout the novel. I found myself quite attached to both of these characters. It's hard not to feel for Amy, with the physical challenges of her life and how they have affected her socially, not to mention her well-intentioned but overbearing mother (who was a pretty interesting character herself.) And Matthew, who was so clearly holding himself back from so much in life, and just needed Amy to help him see it. It wasn't all smooth sailing, of course - they are teenagers, after all, and prone to miscalculations and hurt feelings. But McGovern handled those situations brilliantly. There comes a point in many in teen books in which there is a great misunderstanding. Someone sees or hears something, makes assumptions, and it causes a rift that blows everything out of proportion and doesn't get resolved until the end, at which point I'm thinking, in exasperation, "Had you just asked the person what happened instead of assuming, none of this would have happened." I realize that occasionally these situations may occur in real life, but I for one don't have the restraint to not ask, for instance, "What what you doing with that girl last night?" or "Why didn't you call me?" It is like characters just don't want an explanation, and think nothing of ending an important friendship over something they haven't bothered to understand. But here, when a great misunderstanding occurred, the characters actually confronted each other with these questions, and it all goes to show that the plot can move forward without the characters in ways that are so obviously contrived. This alone elevated this book in my esteem. The audiobook is narrated by Rebecca Lowman, who I wish I could pay to move into my house and read to me all the time. Sometimes I forget that there are actually other narrators who I've enjoyed. It's a problem. She did a great job here, of course. The chapters alternate between characters and one of Lowman's strength is how well she does male voices. 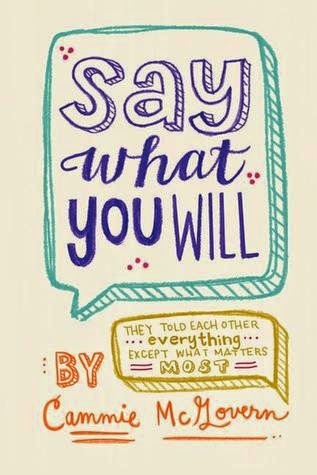 Whether you read or listen, Say What You Will is a must for anyone who enjoys teen fiction.